Need to convince your C-suite that a well-designed office can transform your business and grow profits? Start by changing the way they think about the workplace. Change can only happen after you convince your company leadership that improvements to the physical work space are more than just cost-centric decisions. Doing that means you'll have to present evidence that smart design choices are strategic investments that can deliver business value and impact the bottom line. We packed this free guide with key questions, stunning statistics and bright ideas to help you change the way you think about your space. 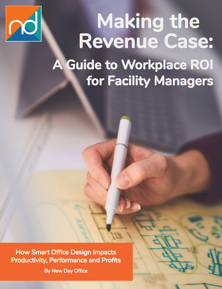 Start the conversation and help your organization's leadership understand how smart office design impacts productivity, performance and profits.